I enthusiastically answered, “Sure!”, not yet fully aware of what I was getting myself into. 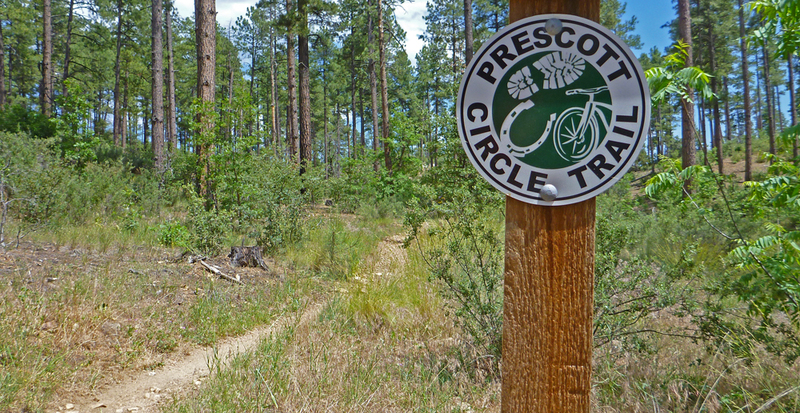 The Prescott Circle Trail (called the PCT, but not to be confused with the Pacific Crest Trail) has been in a work in progress since the early 1990’s, and coincidentally, one of the final sections had just been completed a few weeks before I arrived. Was it fate? Or just an invitation for self destruction. I would soon find out. This wasn’t a sanctioned event, so there would be no real markings. I had a map and I was lucky to have Uncle Jim as a mountain bike guide and Aunt Karen as our crew. Jim had actually helped to create some of the new sections of trail and had ridden most of the rest. He is also an engineer by trade, and naturally had worked out the best route to keep us in the most amount of shade during the heat of the day, which turned out to be minimal, but at least better than it could have been. Karen has been very supportive of Jim’s adventures over the years and has been a fan of my own wild ideas,even hiking part of the Appalachian Trail with me. She was happy to give up her day to crew two crazy guys chasing down a silly goal. We drove south of town to the trailhead at Goldwater Lakes and pulled off the road to the dirt path. Jim prepared his bike gear while I stretched. Shortly after sunrise, in the gray light of the Northern Arizona morning, we set off with a cheering section of one, well, three…Karen and the two dogs. Jim had arranged our starting point so that we began the day with a several hundred foot climb that would have been awfully exposed in the afternoon sun. 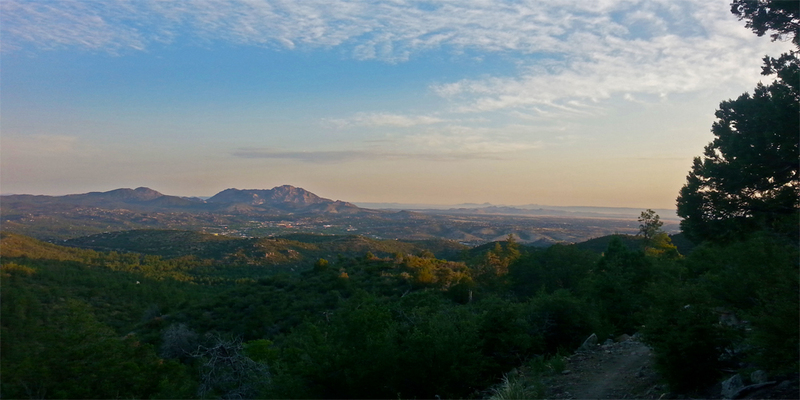 The morning mountain air was brisk and the uphill was a great way to shake out my legs. I climbed ahead of Jim as he navigated his mountain bike around the loose rocks on the steep incline. Soon we descended the Turley Trail and both struggled as we skipped over loose rocks in the washed out sections of the creek (trail). It was technical to say the least, and even with his bike, I beat Jim to the bottom. The next section took us around Badger Mountain and on the newest section of the PCT. While running I was passed by Chris Hosking, the Trails Coordinator of the City of Prescott and part of the Over The Hill Gang that has done a lot of the work on the PCT. He was heading out to begin his day working to smooth out another section of trail that I’d be crossing soon. We chatted a few moments and I thanked him for his work on the trail, making this crazy adventure possible for me. 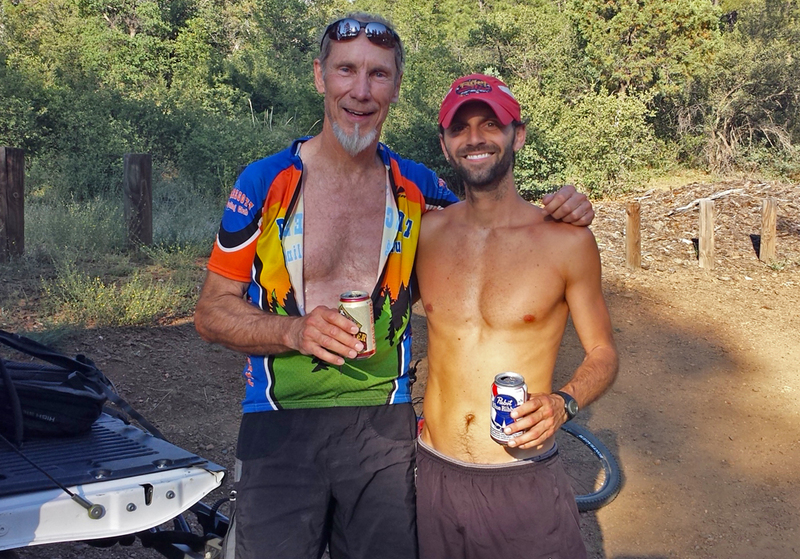 The next few miles flew by with Jim riding ahead and waiting at trail junctions to tell me which way the PCT turned. This was even better than being in a race. No ribbons, no markers, no map, just my own personal bike chauffeur! I cruised down to the edge of Watson Lake for our first aid station. We had covered 18 miles in just under 3 hours and Jim said he could barely keep pace with me. Karen was joined by grandpa and they were both sitting at a picnic table when I jogged in. I refilled my hydration pack with ice and water, grabbed a green juice, coconut water, an apple, cup of pineapples, and snacks. The first section had been relatively easy, but the day was sure to heat up and I needed to be prepared. We finished refueling ourselves, thanked Karen for the support, and took off. 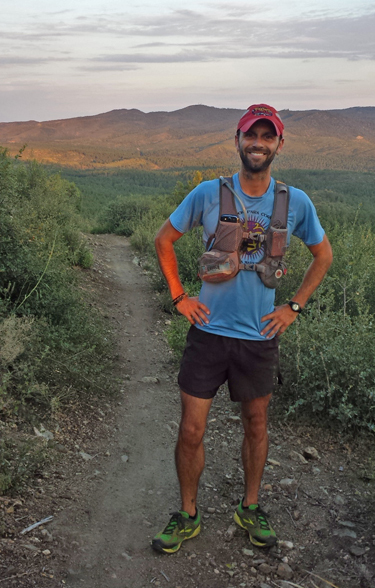 The next section was beautiful, running around the granite dells of Watson and Willow Lakes. The temperature was rising, but the trail was nice and flat, easy to cover ground. We crossed under a road and onto the Embry-Riddle campus on a long, winding, exposed trail. By now it was only 9:00 AM but the early heat started to get to me. I was chugging water and realized that A) I was no longer peeing, and B) I was running out of water. I had been exceptionally hydrated and in good spirits in the first 18 miles, but that had all turned around in less than 90 minutes. We continued on the exposed trails through Pioneer Park and across a section of trail that is still on city streets, conserving water to the next stop. We reached the next aid at mile 30, just 5 hours and 30 minutes into our adventure, out of water, hot, and exhausted. I sat under a tree and devoured the McDonald’s hamburger and fries that Karen brought me, only coming up for air to gulp copious amounts of cold soda. Sitting in the chair I refueled my body, refilled my hydration pack, and drank more coconut water and sports drink. It was nearing noon and we knew we’d be traversing more exposed trails in the hot sun. We climbed the trail from the pit stop panting and looking for shade. Jim joked that we were like the tortoise and the hare, he would speed ahead on his bike and sit in the shade under a tree only to watch me pass him a few moments later. I feel like I really understand what it’s like to be a back of the packer now…you run hard behind everyone else, round a corner, see them all sitting in the shade and get excited to relax, only to see the group stand when you arrive and begin running again. I wanted to rest too, but sitting in the shade was not going to get me to the finish, a cold beer, and a cold shower. I kept moving. We wandered across trails in full sunlight under Granite Mountain. I was hot and tired, but still moving. We hit a long flat downhill section that used to be a rail bed and both of us cruised to the next single track trail that let us to Karen and our third crew stop. When we reached Karen I was pretty tired and worn down. The last time we saw her I was just thirsty, but now I was starting to feel a bit out of it. No problem, we had a secret weapon. 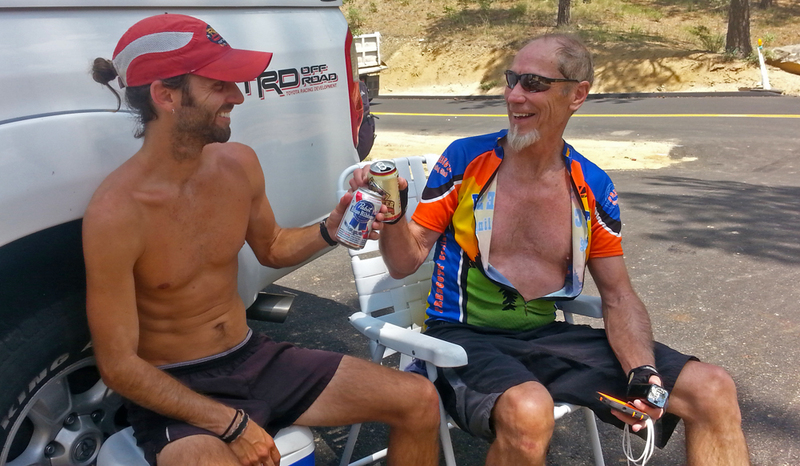 Jim reached into the cooler and grabbed two beers, a Four Peaks IPA for him, and the classic PBR for me. POP! Ahhhh, that should bring me back to life! We sat in our chairs, drank beer, sports drinks, juices, and anything else we could get our hands on. It was mid afternoon and so hot that I was having a hard time taking down food. Or, maybe, I was having a hard time eating because I was pouring 2+ liters of fluid down my throat! Either way, I tried to eat some calories, grabbed the bag of ice and filled my hydration pack, and we set off for the next section around Thumb Butte. As we ventured off into the woods I was a little worried…I had been running for hours but had pretty much stopped peeing. Even with downing liter after liter of water and other fluids, I still couldn’t go to the bathroom. I also noticed a thick coat of salt all over my body from my sweat evaporating. In an effort to rehydrate myself I guzzled from my hydration pack, and then, ssslllluuuuurrrrppppp. It was empty. Uh Oh. That wasn’t good. We were still 6 miles from the next aid stop and I was out of water? No way, I had just filled it 2 miles ago. I reached back to examine my pack and realized I had a problem that I never even knew existed. My pack was frozen solid. In an effort to drink ice cold water I had packed too much ice, and too little water. When I started drinking water I depleted the bladder, leaving only the ice, which wasn’t melting. I stopped, blew air into the bladder, and unzipped my pack to expose it to the heat. After a few minutes of jiggling around while I ran, I was able to get another sip. This would be a long, hot, dry 6 miles…and…that would not be a mistake I would ever make again! By this time I was not only thirsty, I was tired, overheated, and not thinking straight. Jim had gone ahead to the next trail junction and I ran alone. I ran on and on and on…and eventually wondered when I had last seen Jim. A few minutes ago, or a few miles ago? Crap. I stopped, dug out my trial map and investigated. I looked ahead, behind, up, and down to get my bearings. I figured that I was somewhere in the bottom left hand corner of the map. That was a start, but the map was big, so it didn’t help much. I decided to go ahead and find the next aid stop on my own. I sent a quick text to Karen and Jim, “I’m off course, but I’m on a big trail that goes to the same place, so I’ll meet you there.” And then I ran. A few minutes later I turned a corner and found a very confused Jim in the shade at a trail junction. “Where did you go?” he asked? I told him I was on the other trail and he looked even more confused. 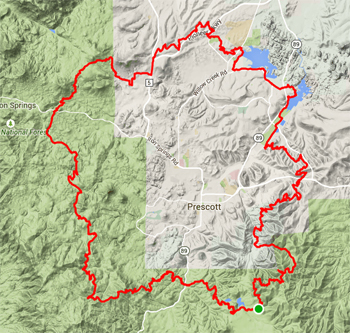 “But this is the Prescott Circle Trail…you are running ON the PCT!” Oh…really? Hmmm, as it turns out, I was not physically lost at all, but the lack of water and the afternoon heat definitely had me mentally lost. I told Jim we’d figure it out later, let’s carry on and get me to the truck so I could finally get some water in my ice! The last mile to the truck was excruciating. I was thirsty and wanted to walk. Basically, I was throwing myself a pity party about running out of water. Well, I started running…errr…at least a little more than I had been. We burst into the clearing and I saw the truck and collapsed into the white lawn chair. I needed fluids. We cracked another beer but I could barely sip it. I grabbed more coconut water and sports drink, but what I really wanted was just plain water. I tried to eat a bar, but could hardly chew. We were now just 4.5 miles from the end, but I sat slouched in the chair, head spinning in my hands, not sure how I was even going to stand up to get water, let alone run another 4.5 miles. We rested for awhile, letting my internal temperature drop and drinking as many fluids as our stomachs could handle. Finally, we got up, geared up, and I staggered off behind Jim for the last hour of running. The final section of the PCT was beautiful rolling hills through thick tall trees and along two lakes…simply gorgeous. I wish I could have enjoyed it. Instead, I was in my head about getting to the finish. By this time I realized that this had been one of the top hardest running days of my life. No, it wasn’t harder than my 100 mile race, or even the Nine Trails 35 mile sufferfest, but it ranked up there pretty darn close. We were counting down the miles, and for that, I was happy. Passing both lakes meant we were getting close to the finish. I rounded a corner and found Jim talking with a guy out walking his dogs. “Hi, I’d like to stay and chat, but I can smell cold beer” I joked as I scampered past. I wound along the trail, eye on my watch, hoping for a 12 hour and 30 minute finish. I finally spotted the road and reached the truck at 5:42 PM, 12 hours, 30 minutes, and 58 seconds since we had started. We had traveled 56 miles, traversed 6,000 feet of elevation change, and most of it was done in the hot sun. I was beat, but happy to be done! Again, I collapsed in the white chair, but not before I grabbed a cold PBR from the cooler. Jim rode in a moment later and did the same. Karen had picked up grandpa and he sat there looking at us, shaking his head like we were crazy. As Jim and I shared our stories of struggle and triumph grandpa called out from the truck, “Next time you guys think of something silly like this I’m going to buy some rope and tie you down!” Agreed grandpa…agreed. I had already told Karen and Jim to talk me out of something like this in the future. They said they’d try, but I knew that I’d probably get myself into new shenanigans by next month, or heck, even next week. Oh well. Life is too short to play it safe. With Karen and Grandpa at the finish. It had been Jim’s longest mountain bike ride by mileage, and definitely by time. He spent 12 hours in the saddle riding ahead, waiting for me, only to do it all again, over and over and over. Karen had shuttled our gear around all day and even stopped at McDonald’s to buy us lunch almost before they were ready to changeover from breakfast. Jim survived the day with a few scrapes on his legs and a little saddle sore, but not too bad. I made it through hot and tired with some gnarly blisters that I didn’t want to deal with until I got home and in a cold shower. We didn’t break any records, but we didn’t set out to. 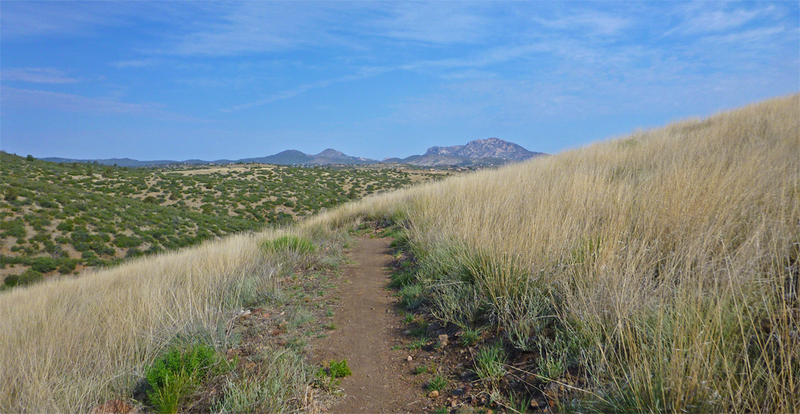 Basically, I had heard about this trail around Prescott, I was in Prescott, and I thought it might be fun. Jim agreed, and we did it. No medals. No results on UltraSignup. No fans. No swag. Just dirt, heat, family, cold beer, and good stories. The best way to do an adventure. Just to clarify the “elevation change.” my STRAVA recorded 6120 feet of CLIMBING. I felt embarrassed to be coasting downhill for the same amount of descent while Chris had to keep plodding along. During the run, Chris never revealed he had blisters on his toes. He’s tough.